Spartan Slots Review - Is Spartan Slots a Legit Casino for 2019? The Spartans in early Greece were known for their military prowess. Spartan slots players, however, don't need to go into battle to find a slot game that they'll enjoy. Spartan Slots is exactly as the name implies. It is a slots casino. Not just a few banks of machines, but nearly the entirety of this online casino is full of slots representing pretty much any theme you could imagine. From multiple pay lines to mini jackpot progressive prizes, these slots are top of the line in entertainment. Clicking the Spin button is just the beginning. slot games could feature Wild Cards or Multipliers that provide two, three or even 10 times the payout for one hand. Many of the games feature a video introduction and players feel like they're an actual part of the game itself. The website is itself is regal and inviting. It portrays itself to be an upscale casino catering to an exclusive clientele. There are no fees involved in being a member of Spartan, though. Registration is a quick two-minute process and a 500% Welcome Bonus is offered to new players who are ready to jump in and make a deposit. Games are nicely arranged in categories and make identifying and selecting a game as easy as possible. Players can even search for one particular game or review options that are provided by the different software providers that Spartan utilizes. There is absolutely no doubt that Spartan Slots caters specifically to slots players but they do have some additional games for non-slots players or for players that are looking for some alternative options. Video Poker, Blackjack, Roulette, Craps, Baccarat, Keno, and Scratch and Wins are all represented within the Spartan online casino. There is even three Live Dealer Action Games to satisfy those players who enjoy the social interaction. Much of the full website is also available in the mobile version for play on tablets and smartphones. Spartan Slots offers other various Bonus Programs, a VIP Club, and banking options that should satisfy the majority of players. Spartan Slots is a slot-based online casino that hosts nearly 150 different slot games from multiple software providers. It has been around since 2010 and has established itself to be a big player in the competition for online slots gaming. The slots are supplemented with some other limited selections for other player preferences including Video Poker, Table Games, and Other Specialty Games. Spartan's above-average website provides a quality and simple playing experience and also replicates itself well for mobile players. There are various banking options that should cater to most player needs. Additionally, Spartan's Welcome Bonus and other Bonus awards are appealing to both new and frequent players. All of these attributes plus easy to access Customer Service, a VIP Club, networked big jackpot slot games, and reputable software providers all combine to make Spartan Slots a good choice for dedicated slot players. High marks for Spartan Slots and its slot casino. Spartan is a slot lover's casino, hence the name, and it's obvious right up front that slots are the game of choice. Simply providing slot Games isn't enough for any casino, though. The games need to be plentiful and diverse in their look and feel in order to appeal to players of all generations and preferences. Spartan Slots does not disappoint. There are so many different games that a player may have a difficult time narrowing them down to just one. 141 games and 114 in the mobile casino rival many live casinos. Then, let's factor in all of the fun embellishments to the game itself. 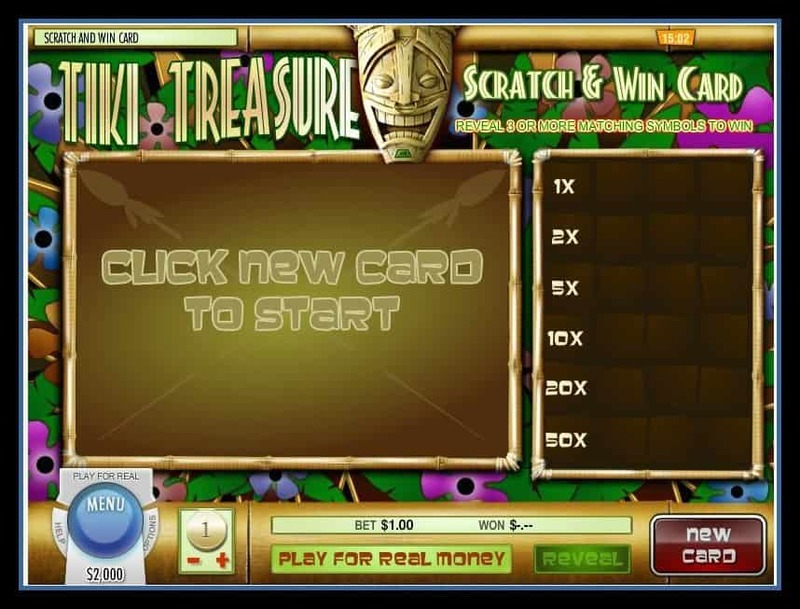 The slots have add-ons such as Wild Cards, Multiple Pay Lines, Scatter Bonuses, Multipliers, and Random Bonuses. The entire slot Game casino is first class. Typically when we discuss other casino games, we're talking about the miscellaneous games that don't fit into any of the standard categories. However, in this case, we're referencing all of the other games outside of the slot Game area. These include Video Poker, Table Games, Live Table Games, Keno, Baccarat, and Scratch and Win cards. In comparison to some other casinos, these games are extremely minute in number and variety. However, on Spartan Slots, they provide some additional opportunities for players who are not always looking for the slot Game experience. The Live Dealer games are a nice addition to the groupings and multiple Blackjack and Roulette tables provide those dedicated players with some options. We would love to see expanded Video Poker selections with games living up to the slot theme by providing "extras" to enhance the betting experience. Additionally, some other Table Poker games would nicely fit into the Table Game area of this online casino. The mixture of gaming options on Spartanslots.com is more than enough to really please dedicated slot Game players. There are so many options and variations of the game premise and a player need simply select a theme they like and give it a spin. It would be difficult to expand on the variety as Spartan has really covered a wide range of possibilities for slot play. When it comes to other games, though, variety could be enhanced in regard to a few of the categories. There is only one Keno game, one Baccarat, one Craps Table, and one Casino War game that is actually the only different type of game in the Table Games category, except for casino standard games. Poker could be better represented and other players may enjoy Bingo or other Table Games such as Let it Ride or Pai Gow. We don't really need to know the exact locations of players who opt to access the mobile casino, but we know that on the go gaming is in high demand. The convenience that tablets and smartphones provide has contributed to a mobile society. The Spartan Slots mobile casino fits the bill for quality and easy mobile gambling. The website is really attractive both in full website and mini. More importantly, it's incredibly user-friendly so there are no worries about wagering via the small screen version. We would give this category a five-star rating, except that Spartan's mobile casino is sparse in games aside from slots. There are no Live Dealer Table Games, only one Video Poker game, six out of 11 of the Table Games, and no Baccarat from the Other Games category. Casino wins are not truly "wins" unless they equate to dollars and cents. Cash out methods should be plentiful enough to cater to players of varied financial situations and Spartan Slots does a decent job in offering multiple possibilities. No, the credit or debit card that a player uses cannot be replenished with a cashout. Visa, Mastercard, and American Express are only tagged as deposit options. However, players can opt to use Money Transfer, Bank Wire, ACH Bank Transfer, or Paper Check by Mail. These come with varying fees, minimums, and turnaround times. Money Transfers are designated the fastest and easiest way to get those payouts into the hands of the players. We're finding it difficult to come up with a bonus program that is not offered to Spartan Slots players. The bonuses that the casino offer pretty much run the gamut and some others are even available upon request. They offer deposit bonuses, free money bonuses, sign up bonuses, and cash back bonuses. Our reason for giving this casino such high marks in this particular category is because of their Welcome Bonus. The five-time 500% Match Welcome Bonus plus 25 Free Spins is definitely one of the highest awards out there and should be enticing to new players to Spartan Slots. Two contributing factors comprise our rating in this particular category. One being the availability of the Customer Service Department and the other is the quality of Customer Service. The first is fairly easy to determine, the latter is subject to interpretation. Spartan Slots' Customer Service is right up front and easy to access. They offer a 24-hour a day, seven days a week Live Chat service to provide players with immediate assistance and response. Additionally, a support email address is provided on the website for an elevation of issues or simply as a preferred alternative method of contact. A phone number is not available on spartanslots.com. When it comes to the level of Customer Service, we go to the players themselves who have first-hand knowledge, and Spartan players are generally (more often than not) pleased with the quality, professionalism, and friendliness of their interactions. Spartan Slots utilizes multiple software providers to present their games to players. The games feature the latest in flash technology with above average graphics, large buttons for wagering, and video and audio enhancements. The website itself reflects a more upscale established casino. It's set up with the player in mind and puts the games in the forefront. Game interaction carries over to the mobile casino with near-equally impressive game play despite the smaller size in which to work. We're impressed with the colors, the graphics, and the overall feel and utilization of this casino. So, Spartan Slots is licensed by Curacao e-gaming. Some players have referenced this particular licensing as subpar when it comes to policy-making and enforcing of online casinos. However, we have found that there aren't huge significant issues that would be affected by alternative licensing. Curacao e-gaming has contact information posted in Spartan's Terms and Conditions area and can be reached to intervene in player-related issues if they arise. As far as reliability and security of the website itself, Spartan Slots has website security provided by Norton and McAfee. Additionally, it is PCI Compliant so credit card transactions are protected and the Gaming Labs Certification provides an additional layer of reliability and respectability. The Crown Jewel of the Spartan Slots Online Casino... the slot game area. Plentiful in number and rich in variety, slots games are very well represented in this casino. Slot players these days are fired up by all kinds of added enhancements to the games that are out there. Just as technology is ever evolving in regard to television, video streaming, video gaming, and mobile apps, it is just as advanced in the casino industry. There are a handful of really top-notch software providers who can accurately simulate the games found in a live casino on computers and mobile devices. Spartan Slots uses a few different software providers to further enhance their quality of player interaction. Vig Gaming (visionaryigaming.com) is behind the Live Dealer Games, and other software providers include BetSoft, Rival, and Octopus Gaming. Their games are innovative and impressive, providing a superior experience for players. As far as the betting requirements, these slot machines cover the gamut of budgets. If a player wants to take advantage of all of the "extras" that can the game provides, he or she will usually need to bet all pay lines and sometimes it may even be necessary to select the maximum bet amount. Multipliers, jackpots, wild cards, etc.. all have individual triggers so players need to review the rules of the particular game they've selected to take advantage of all of the additional opportunities to increase their bottom line. $.01 is the standard lowest denomination and this lower bet per line is available on many of the slot Machines. If a player opts to just play one line at a time, they're only betting $.01, but could miss out on some extra free spins or multipliers that multiply the fun. Most Jackpots offered on slot games come with a minimum required bet that's typically a wager on all available pay lines. Spartan Slots does offer some mini Jackpot games. These are separate from the larger money jackpot progressive types, but offer players a chance to win a few thousand as opposed to a few hundred. These particular games are designated by a "JP" in the title. 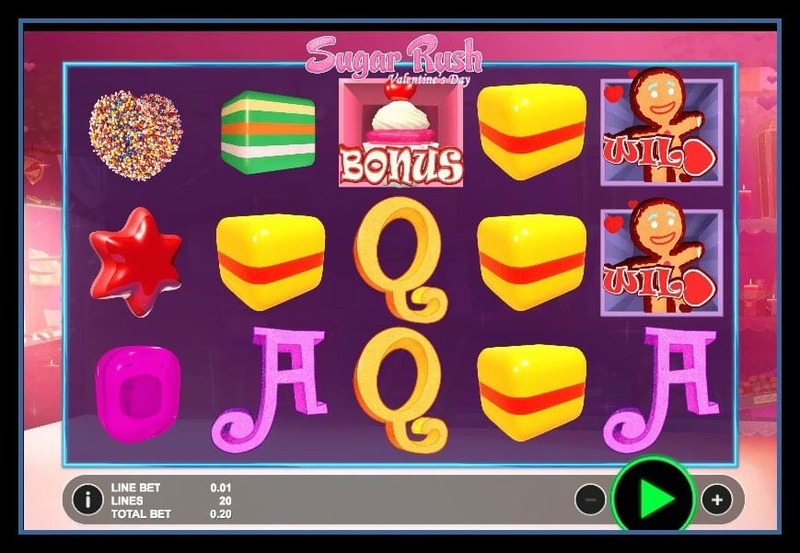 Taking a look at one of the more popular games on Spartan Slots, Sugar Rush Valentine's Day, you'll see that it is a more basic type slot game. The symbols are simple and large, and the screen is not overly cluttered or confusing. It can be deceiving, though, as this game features 20 pay lines as well as Wild Cards and a Scatter Bonus. It is not a mini jackpot slot game, but the little extras can equate to a little more money per spin. This particular game is provided by Octopus gaming and they have a similar simplicity to many of their offerings that also include Bee Land, Ducks 'n' Eggs, and Fruit slot to name a few. So, we've established that Spartan Slots places some bigger money up for grabs through their mini jackpot slot games. These are four-figure top prizes, but always exciting to claim. For some, though, nothing will do like being in the running to win a million dollar jackpot. Of course, these prizes are awarded only very occasionally, but they are still viable and someone has to get lucky, right? Spartan Slots Jackpot Games are included in both the regular slot Game area or they are in an area on their own, accessible by simply clicking Jackpot Games. Game play is not limited to Spartan Slots members alone. These are progressive games and are linked to multiple online casinos. The larger player pool allows for the bigger money to accumulate. There are basically five different games in the Jackpot area but three of the games are offered in both single line and three-line versions. The two versions share the prize pool with one jackpot offered for both. Not surprising, all of the other Spartan Slots games are underwhelming in comparison to the abundance of slots that they carry. Yes, there are some alternative selections for players who are looking for something else, but the other available games are much more basic and not nearly as plentiful. Honestly, the Video Poker area is either severely lacking or is fairly sufficient depending upon the type of Video Poker player utilizing it. In general, the Video Poker games are geared toward the more traditional-type player. There are only five games and they're fairly basic with "Jacks or Better" leading the pack. Pun intended. The other four have wild cards associated with the play. Regardless, they are straightforward games. One hand is played at a time and no little extras are added to shake things up. What we mean by that is that the incredibly enhanced and technologically advanced slot Games feature a lot of interactive components to keep players engaged. Video Poker is not so different. There are all kinds of new versions that take the game to the next level. From multi-hand play (like multiple pay lines on slot Machines) to bonus round triggers to spinning reels and multipliers, newer Video Poker marries the traditional strategy game with a lot of fun bells and whistles and potential to win bigger and have more fun. As you can see, Blackjack players and Roulette players are well taken care of in the 11-game Table area. Five adaptations of Blackjack and four Roulette varieties provide a fairly well-rounded game menu. Online casino players do tend to select Blackjack and Roulette as their games of choice in the Table Games area so Spartan does a nice job of accommodating them. Taking these two featured games a step further, they are the only options for mobile casino play from tablets or smartphones. Craps is a game that many players express their desire to learn and that can be satisfied through Demo Play on Spartanslots.com. Demo Play allows for practice play on a game that players either aren't familiar with or they simply choose not to wager real money toward. Craps is a good game to offer practice play and Live Chat assistance could still answer questions and offer guidance to raise a player's comfort level before he or she converts to regular betting. Casino War completes this grouping with a great option for players of all experience levels. It's very similar to the regular card game and is basically a "highest card wins" game. So, maybe you're at home and you enjoy visiting an online casino like Spartan Slots as it's something fun to do and maybe even a regular hobby of yours. There is an unbelievable number of slots and other games to keep you busy, but you'd like to venture out and be a bit more social. Hmmm.... A dilemma. Problem solved. Blackjack, Baccarat or Roulette games each one featuring a live stream of a real person. No computer generated images here. We're talking about a person with whom you can carry on a conversation. Now there are only three games, but they still provide the opportunity for this type of betting for players who prefer it. The only drawback of the Live Dealer Table Games is that they are not available on mobile devices for playing on the go. They must be accessed through a regular computer, PC or Mac. The misfits of the casino that actually provide a lot of fun and a really different gaming experience... the Specialty Games. Spartan Slots refers to them as the Other Games and they also have their own dedicated area of the website. These games are diverse and don't really fit into another category so peruse the Other Games selections and you may find your new favorite one. The Scratch and Wins are online scratch cards representing different topics or themes. As you can see in the Tiki Treasure example, three matching symbols equal a winning card. Scratch and Wins don't have a lot of strategies involved. It's basic luck. Select three symbols and hope for the best. It can be a lot of fun to give it a try though, especially if you get that winning combination straight out of the gate. A good assortment of games is a key provision when catering to online players or any players for that matter. People like choices and, even if someone prefers one type of game, they may wish to experiment with different variations of that game. Slot Players are treated to so many different themes and choices that it may be hard for them to decide where to start. Every single one of the 141 slot Machine games has something unique about it. Each has an accompanying theme that carries through the look, sound, and feel of the game. And, the differences don't stop there. Each game also has an assorted combination of those little "extras" that enhance the modern slot experience. There is definitely not a downside to the variety of slot games offered on Spartan Slots. Move on to the other areas of the casino and it's a slightly different picture. We can best sum up the games in all other sections as a good representation of many casino standards, but not an outstanding array. Blackjack, Roulette, and Scratch and Wins are fairly decent in the options that they provide. We wouldn't think that players who enjoy these three games will be disappointed. They are still invited to make a few choices anyway. Video Poker, Keno, Baccarat, and other Table Games could definitely use some new additions to the mix. There aren't any Table Poker games offered and only one Keno game from which to select. Players who are a bit more experienced in the online gambling world may find the Spartan Slots' non-slot options to be quite limited. 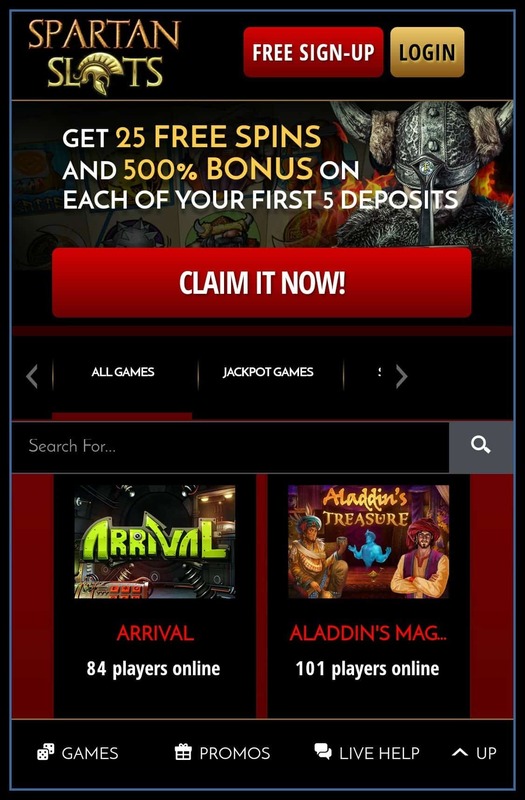 Pick up your tablet or smartphone and type spartanslots.com into your browser and you will be quite impressed with what you see. The Spartan Slots mobile casino is just as striking as its full site counterpart. The web designers did an outstanding job of translating the full site into the mini version. There are so many websites that are challenging to use on mobile devices, and online casinos offer the additional challenge of the repetitive dealing and selecting that transpires during game play. Mobile players on Spartan Slots should have no issues in this area. The graphics are big and bold and the site is streamlined and nicely laid out for ease of use. The registration page opens up to a full, albeit small, screen and all of the areas of the casinos are nicely represented with the one exception being the Live Dealer Game area. Live Dealer games cannot be played on tablets or smartphones. Everything else, though, is present and accounted for but may not include all of the games in a particular area of the casino. Let's get right to it. This is a slot lover's casino and the slot Game area is plentiful. About two-thirds of the full slots line-up can be played on mobile devices. The games that are not available don't even show up on the screen so players may not even know what they're missing. As far as the Jackpot slots, specifically, if you are looking to claim that million-dollar prize, you are going to need to select Sweet Surprise. Sweet Surprise and Crazy Jungle are the only two selections in the Jackpot Games area. One game stands alone. That standard game that we've already referenced, Jacks or Better, is the only Video Poker game that can be played on mobile devices. The playing experience is good, though, with quality graphics and easy betting and selecting. Table Game players do find it beneficial to be able to take their betting on the go. Many Table Game players are game-loyal and are looking for one particular table to pull up their seat. Blackjack players and Roulette players are offered multiple versions of their favorite game in the Spartan Slots mobile casino. Blackjack and Roulette play in mini version is just as appealing and fun as on the full website. Unfortunately, the one Demo Play game, Craps, is not available for regular or practice play on tablets or smartphones. Click that "Other Games" button on your phone and take your pick of seven games, six Scratch and Win and one Keno. We do need to say that there are several Demo Game options for Scratch and Wins, but it is really difficult to access them. If you don't click the Demo Play button 100% accurately, the registration page pops up so it can be a bit frustrating. But, on the flip side, you don't really need to practice Scratch and Win play, do you? It's a mini wrap on mini play... the Spartan Slots Mobile Casino is so visually attractive that it does reel you in and make it enjoyable to play regardless of your location. The non-slot selections are a bit limited but Blackjack and Roulette players can have some fun wagering on the small screen. Online casino banking transactions... eek! They are challenging regardless of if you're a Spartan Slots player or a player on the numerous other online casinos. Online casinos may feature the best in gaming software and user-experience but all of them need to come a long way when it comes to funding a player account and, hopefully, being able to reap the benefits of winning at a given time. Spartan Slots is one of the more middle of the road casinos when it comes to banking transactions. They do offer multiple options for both depositing and withdrawing, but each comes with its own set of guidelines and hurdles to jump. Let's talk depositing first as it is easier than withdrawing and is necessary in order to get to that cash out phase anyway. The minimum deposit amount is $25 and the most straightforward way to deposit is by using your debit or credit card. A quick and easy form that will take you about 30 seconds and then it's in the hands of your banking institution and, from this point, it's a craps shoot. Some banks instantly approve the transaction and others may need to be contacted first. If it is approved, the funds are instantly deposited and made available in your player's account so you can let the chips fly. OK... you've won. You're excited. You want to go out and buy that new pair of shoes or latest most updated TV. How do you get your winnings out of your player's account and into your bank account? Well, first of all, you need to make sure you have at least $100 you can withdraw. Then, you either click the Cashier Button or go directly to the Live Chat customer service experience that puts you in touch with a live person very quickly. There are multiple withdrawal methods that can be utilized, but Spartan Slots specifically states that the Money Transfer option is the fastest and easiest offering same day funding after the casino approves the withdrawal. Oh, did we mention that the casino must approve everything first? What Spartan doesn't specify is how much a Money Transfer will cost a player. There are fees attached, but they are not publicized on the spartanslots.com. This is a good option that allows players to actually get that money bank into their bank account. Again, banking information verification is necessary but the minimum transaction is only $100 and the fee is just $10 for transactions under $1000. Think of it as tipping the slot host when winning a $1000 jackpot in a live casino. 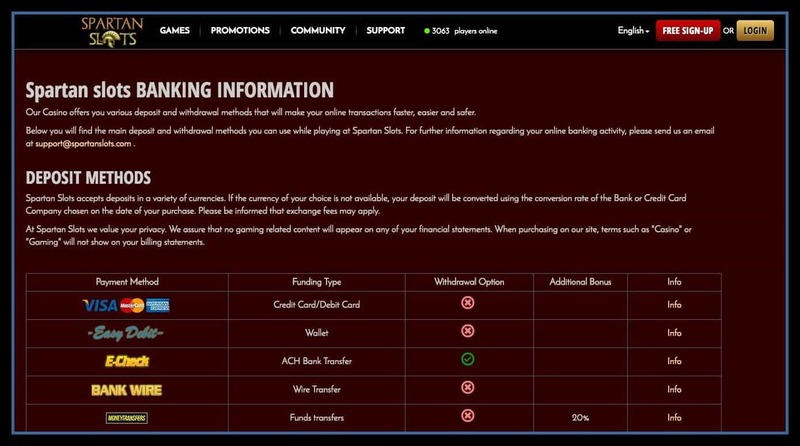 Lastly, players can take a look at the "Paper Check by Mail" method but Spartan Slots states that this option "Is only available only an ATM machine". Hmmm... Also factor in a 12-business day turn-around, $300 minimum withdrawal, and $20 fee and you'll be waiting a long time for those shoes or that TV. We highly suggest that all players get in touch with Customer Service either by Live Chat or email to get all of the details and assistance needed to figure out the best mode of banking transaction for them. Hold on to your hats. Spartan Slots offers a 500% Welcome Bonus that's applicable on the first five deposits. It's huge! Players looking for that substantial Welcome Bonus will be pleasantly surprised when they pull up Spartan Slots and see this multi-tiered, high percentage match play bonus. Stop right there, though. Players need to always be educated on the stipulations associated with a Welcome Bonus or any other Bonus offered by an online casino. Don't get us wrong. They are issued and available as presented, but some players gloss over the terms and conditions and end up disappointed in the winnings that are unable to be cashed out. We've seen more player complaints associated with bonus programs than anything else and they're usually because of non-compliance with the stipulations that casinos attach to these bonuses. So, a new player sign-up bonus... 500% match play plus 75 times wagering requirement that's applied to both the deposit amount and the bonus amount and then be sure to review the contribution percentages that accompany each game. Certain games don't even contribute to the wagering requirement so this is important stuff. Look at the difference between Blackjack and slot Games and you'll see why we stress the importance of being educated on all of the ins and outs of bonus requirements. As the name implies, there is a "cash in" requirement attached to this deposit bonus and it's a match play bonus that accompanies the actual in cash deposit. Let's put aside wagering requirements here as Cash Back Bonuses don't have any attached to them. However, players receiving Cash Back bonuses have already lost money from their player account to the casino. A Cash Back Bonus is a way to recoup a percentage of the loss amount as a special bonus that is eligible for instant withdrawal. Throw the wagering guidelines away in regard to this program. OK.. so you've deposited some money into your Spartan Slots account and you enjoy the playing experience and want to continue but you're hesitant to deposit again at this time. What do you do? You click that Live Chat button and ask Customer Service for a Free Money Bonus. This is a no-deposit-required bonus but it does come with a 99 times wagering requirement attached to it. Let us repeat that. It's a 99 times wagering requirement or nothing converts to any cash out funds. This bonus is given at the discretion of the casino and is not highly publicized. The Spartan Slots Customer Service Department is very prominently featured on spartanslots.com with a Live Chat button on the homepage as well as a publicized email for players opting to use that particular option. Customer Service is an important part of the online casino experience as it's necessary, in some cases, to facilitate certain banking transactions. Additionally, customer service oversees bonus issuance and programs, the VIP Club and status, promotions, and game play concerns or issues. We rely heavily on player feedback in this area as players who have actually interacted with Customer Service have the most accurate input. Spartan Slots players are generally pleased with the quality of Customer Service they receive, regardless of the method employed. They describe the representatives as kind and knowledgeable who strive to solve issues in one interaction. That's certainly not to say that there aren't issues and problems that players do experience, but it definitely makes it easier to have a compassionate, understanding, and helpful person in your corner. Here's the scenario. You pull up an online casino and are ready to do some gambling. You enjoy certain games and look forward to playing and you also hope to come out ahead. Aside from the banking options, what types of things are important to players whether playing on a full website or a mobile device? A website that's top notch and high quality that gives you the perception that it's a dependable business who cares about its players. An easy to navigate website that's as easy as possible for players to negotiate whether it's their first visit or their 100th. A casino that makes sense with games that are neatly categorized, buttons that are easy to select, and interaction that makes a mistake a rare occurrence. After all, this is your money at stake. Mistakes are not an option. Spartan Slots doesn't disappoint in regard to their user interface. One second on their website and you are treated to a professional upscale presentation. You know how many people are currently playing and you feel at ease due to the reputable software providers and security measures that are in place. The color scheme is rich and vibrant and the graphic depictions of the games are top-notch. The back-end of the casino is courtesy of multiple software providers including Rival Games, BetSoft, Octopus Gaming, and Vig Gaming. While it's nice to support the little guys, it's more important to recognize that the big players are in play on a casino website. Players could have a lot of fun simply spinning slot reels or selecting cards, but the new and modern technology provides for so much more. Accompanying video and audio plus live casino-like screens lend to the superior experience that online gamblers are now treated to and have come to expect. Before we even get to the security measures and review process that accompanies Spartan Slots and its website, we do want to note that its reputation is fairly good in the online casino community. There are definitely complaints of occasional slow to receive payments and players who are contesting the reduction in cash winnings due to bonus requirements but, as far as straight out non-payment or unfair gaming, these are non-issues as far as we can tell. Spartan Slots is licensed by the Curacao eGaming Commission and they do prominently post contact information for players that wish to elevate concerns or share their positive interactions. Security within the website itself is of utmost importance for online casinos. There are banking transactions being conducted and continuous game play with real money at stake. Spartan Slots promotes that its site is both Norton secured and McAfee secured. When it comes to the actual fairness of the gambling itself, Spartan Slots has been independently certified by Gaming Labs, an organization that measures standards for fair gaming practices. What is the minimum age to play and wager on Spartan Slots? All players must be 18 years of ago or older but must also meet geographical criteria. United States players are accepted but there are some other locational restrictions. Spartan Slots launched its website and mobile website in 2010. Both the Casino and its Customer Service department provide 24 hours of service, seven days a week, and 365 days a year. So, basically, they never close. No. There is no fee associated with being a player on Spartan Slots. In fact, Spartan even offers Demo Play that is free practice play gaming open to the public. Registered players who wish to put real money into play are subject to a $25 minimum deposit requirement. What types of games are offered within the Spartan Slots Online Casino? We'll start with the obvious category, which is the slot Casino. Spartan Slots relies heavily on slot Play and offers 141 different games including eight Jackpot Progressive slots Games. Other types of games include Video Poker, Scratch and Win online cards, Keno, Baccarat, Live Dealer Games, Blackjack, Roulette, Craps, and Casino War. There are five deposit methods for players from which to select. The first option allows for Visa, Mastercard, and American Express deposits using a debit or credit card. It's a simple transaction using the form that pops up when pressing the Cashier button. The other deposit options are Easy Debit, E-Check, Bank Wire, and Money Transfer. There is a $25 minimum deposit requirement imposed on all deposits regardless of the method. United States players are definitely catered to and the U.S. dollar is the default currency utilized on Spartan Slots. However, there are some other options available to non-U.S. players including the Euro, the South African Rand, and Australian and Canadian dollars. During the registration process, players can select from those additional currency options and then, from that point on, banking will be conducted based upon their chosen preference. The minimum amount would actually be zero if a player opted for Demo Play only. However, this method doesn't come with any winning possibilities. No bets in, no cash out. As far as regular money gaming, there are some slot machines that start out with a denomination as low a penny a line. Players only interested in having a bit of fun, but not betting too high can even select one line of play. We caution players about this, though, as some jackpots and other extra methods of winnings do have multi-line and maximum bet requirements. A Welcome Bonus is only cashable if the stringent wagering requirements are met to the letter. That means the wagering requirement also combined with the contribution rate of a specific game. Bonuses can be real bonuses to lucky players, but can also be of great detriment to players who don't follow the guidelines 100% to the letter. Does Spartan Slots allow players to bet on credit? No. All wagering is done via the player's account that includes the actual amount of deposit plus, possibly, any bonus funds. In some cases, players can ask for a no deposit bonus and can gamble with house funds, but these are subject to a 99 times wagering requirement before any cash out can be requested so it's not like playing with real money and only real money. Do you need to bet real money in order to play the games on Spartan slots? No. As we mentioned before, there are a number of games in the Spartan Slots online casino that feature a Demo Play option. Demo Play allows people to interact and have fun with the games without any deposit required. In fact, registration isn't even required in order to utilize the Demo Play feature. Now, that can be a huge plus for some people but, if you're someone playing in Demo Play mode and you hit a big jackpot, it may be quite discouraging for you to know that you can't cash out anything. Additionally, players can bet using the no deposit bonus that we've mentioned a few times but that does come with a 99 times associated wagering stipulation. Are there other promotions or offers for Spartan Slots players? There definitely are other promotions, and availability and offers can vary monthly. Spartan Slots does offer a VIP Club program that all players are automatically opted in to and this club provides additional bonuses and other levels of player rewards. The higher your status level, the more benefits you're offered. Additionally, they have betting-related promotions that result in a winner's tote board of standings. Higher bets equate to higher standings and Spartan Slots players compete for the highest ranking in order to win more cash and prizes. Various other promotions offer players the possibility of winning trips, jewelry, cash, or other fun prizes. Is Spartan Slots mobile friendly? Yes. Spartan Slots is 100% mobile friendly and its mobile casino is of superior quality. It retains the look and feel of the full website with the same colors, layout, positioning, and navigation. Registration, Player Rewards, Customer Service, and Banking can all be conducted in the mini format. Additionally, game play is only minimally impacted, but not all games are available in the mobile version, and none of the Live Dealer Table games are offered. Is SpartanSlots.com a secure website? Yes. Spartan Slots has taken measures to ensure that every player's personal information is protected and banking is secure. The website is Norton and McAfee secured in regard to the overall experience. PCI compliance protects those important banking transactions, and Gaming Labs has done independent testing in regard to fairness with the actual game play.